We supply and install a range of electrical heating solutions for both home and business. Here at Finish Electrical we have been installing electrical heating products for many years. We are able to install and maintain a large range of electrical heating products including electric underfloor heating, electric feature fires, fan heaters, electric and dual fuel towel rails and hard wired panel heating systems. We offer a complete service which means we are able to supply, install and commission a wide range of electrical heating products. We are also able to offer ongoing maintenance where required to appliances including, electric boilers and heating systems, Instantaneous hot water heaters, Immersion heaters and electric showers and power showers, Air source heat pumps (ASHP), Gas central heating systems, Oil powered boilers, Air conditioning units and Wet under floor heating systems. Fully approved Part P domestic electrical installers. Electric underfloor heating systems can can be simply laid out onto existing floors with a new floor covering on top rather than having to dig floors up. There are heating systems for any type of flooring e.g. laminate flooring, real or engineered flooring, tiled floors, carpet, vinyl and polished concrete. Electric underfloor heating can be used as primary or secondary heating. You are able to run another form of heating alongside your underfloor heating if desired. As electric underfloor heating is fitted under the entire floor area the spread and distribution of heat is even throughout the room. Underfloor heating ensures that your feet are warm and toasty. It is hard to beat the feeling of walking into a room fitted with underfloor heating. Panel heaters can be perfect if you have no other form of heating available. Electric panel heaters are easy to control and ideal to heat just a single room. They are also quick to boost if you need to heat the room in a hurry. Panel heaters have the option to be fitted along with room stats and timer controls to give the ultimate in control. Installation is straightforward with minimal disruption. Fan heaters are verstile heaters and can be used in many different rooms and situations. In the home fan heaters are commonly used in bathrooms as they are a great way to heat a small room quickly. Other uses in the home include being fitted under kitchen plinths to direct gentle heat at foot level in order to keep feet nice and warm. Commercially fan heaters are often utilized set above shop, office or restaurant doorways directing a screen of heat downwards as you walk into the building. These fan heaters are designed to make a “screen” and keep existing heat in the building whilst the door is open. Off peak heaters are best used along with an off peak meter. These meters only become live at night, and as such you receive a cheaper rate on the electric they use. These heaters are designed to charge during the night (12pm till 7am normally), and then release heat and hot water during the day. Both types of heaters can have a normal electric (on peak) supply as an over ride if they do run out of charge. Electric heated towel rails can found in 2 forms. Some towel rails are only heated by electricity. 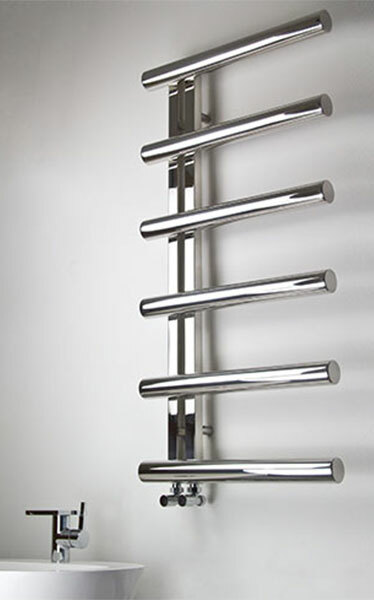 It is also possible to have an electrical heating element installed into a towel rail that is connected into the central heating system of a property. Towel Rails are a great way to warm and dry towels although they can also take the chill off the room or indeed as primary heating for a room.